GEORGE FRANCIS GOLDBACH (73) passed away shortly before noon after a 10-year battle with cancer. As his eldest son, I leave this single page entry in his memory. He was intensely proud for living without getting near the Internet. He wouldn't have a Web connection. He couldn't fathom what people saw in the Internet and he wouldn't have a part of it. Three of his five sons use the Internet every day. I didn't have the heart to tell my dad that his objection to a county planning meeting caused his name, address and phone number to be permanently archived as part of a Web site. As this reference will be too. I miss him but will never forget his kind and gentle soul. I will also never forget the outpouring of concern that followed his death, funeral Mass, and burial. I've always felt so incapable of filling his shoes, yet he never created pressure to perform. Instead, he simply gave a warm and loving example, through 49 years of marriage and 73 years of life. Picture of George Goldbach (center). Born 7 April 1929. Died 11 February 2003. Surrounded by sons Michael, Bernard, Gregory, David, Patrick and wife Evelyn. 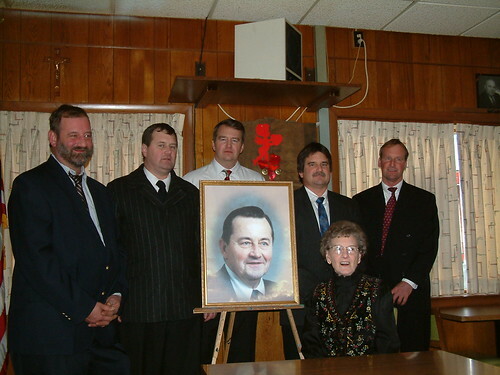 Picture taken in Knights of Columbus Hall, Lancaster, Pennsylvania, Saturday, February 15, 2003.